What are your plans for Memorial Day Weekend? For me, it’s always been the weekend that kicks off summer. The past few years I’ve spent this holiday on Lake Austin, but this time I’ll be heading somewhere a little cooler (but hopefully with less rain!). Tomorrow morning I fly out to Carmel to meet up with my sister, mom and stepdad. It’s been over a year since my last visit, so I’m looking forward to hitting up my favorite spots (The Bench! GBG! Rocky Point!) and checking out some new ones! Specifically, I’m eager to make the drive up to Big Sur – I hear the views are incredible. For those of you heading somewhere warm (or enjoying the sunshine in your own backyard), here are a couple of easy looks for whatever occasion comes your way this weekend! This simple striped dress is by Tibi and is #1 on my list for a summer frock. It would look so amazing during the day with a good pair of sandals and your favorite panama hat! It would also be lovely with heeled espadrilles for a night out. The second look would be perfect for a Memorial Day wedding or dinner out at the country (or yacht?) club. I have this dress in turquoise and it fits like a dream. The navy shade would be a wonderful transitional color for fall – just throw on a leather jacket and you’re good to go! I NEED that striped Tibi dress! 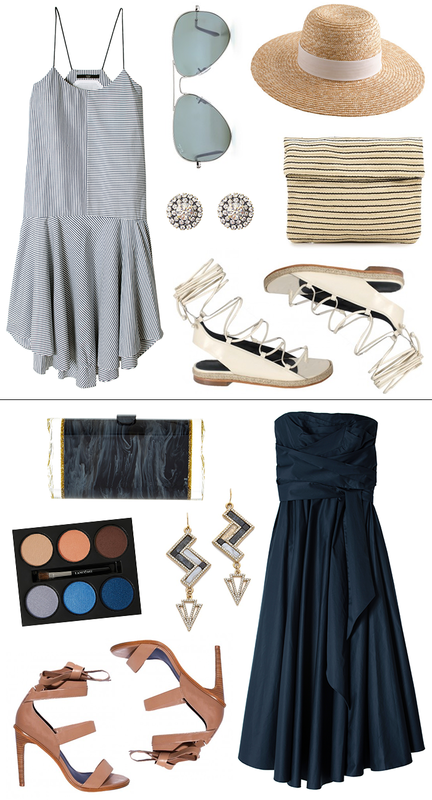 I think it could totally go from day to night with the right accessories! Great picks – I especially love that stripped Tibi dress. It is perfect for a hot summer day. I LOVE Carmel! Isn’t it sooo picturesque?? I hope you have a great time. Love all these picks especially that striped sundress…too cute! I love this post! Such a great idea, Merritt. Safe travels. Have a great time! These outfits are perfection. You have great taste, love following you! Those are some really fun looking sandals! Loving your picks! Perfect for summer! I love both looks, but especially that first dress. So perfect. Have a lovely long weekend, Merritt! I need a new sun hat, this one is money! I definitely need this hat! Have a great weekend! In love with that striped dress, in.love.